So far, of all ultra-wide zooms, the top performer has been Canon EF-S 10-22 mm, which in the middle and at the end of its focal range had no problem with reaching or even exceeding the excellent level of 40 lpmm. It was somewhat worse at 10 mm, for the lens would present us with a rather flat resolution graph, with the sharpness fluctuating between 36 and 37 lpmm. What is the situation in case of Tokina 11-16 mm? Let’s look at the picture below, showing the MTF50 values achieved in the centre of the frame in Canon 20D RAW files. First of all, its performance for different focal lengths is much more even than Canon’s. In this case too, the middle of the range is the best , but the widest angle doesn’t fail to keep up. 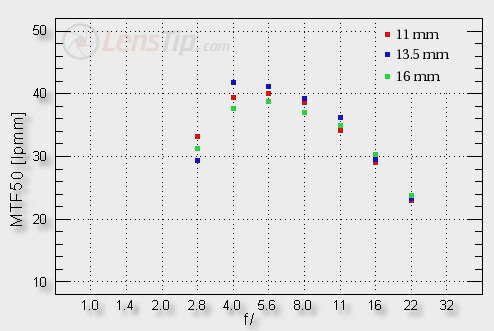 Tokina’s performance wide-open is worse but we have to keep in mind that for Tokina, wide-open means F/2.8 and for Canon, it’s merely F/3,5-4,5. Furthermore, even at F/2.8 Tokina achieves the value of completely useful 30 lpmm, which is quite praiseworthy. Stopping down a little makes it reach the level of almost 40 lpmm, providing the photographer with images of excellent sharpness. Bravo! Another thing is the performance at 16 mm, which doesn’t seem worse than at other focal lengths. The results presented in our charts are always a result averaging the measurements from several test charts. In case of Tokina 11-16 mm, we used just two of these, as the others were too small to fill the frame. 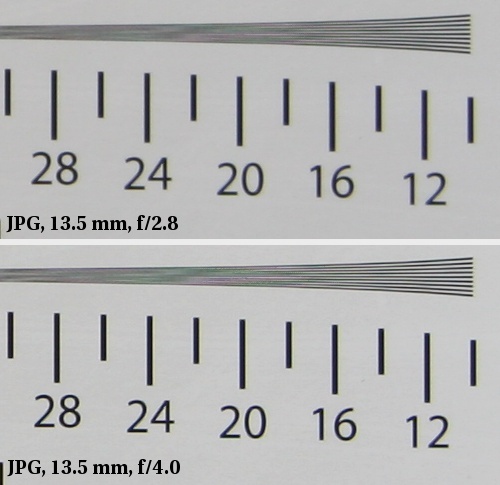 We noticed, by the way, that at 16 mm, the results acquired at the smaller chart (which was shot from a distance not much bigger than the lens’ minimum focusing distance), are noticeably worse than those acquired at the bigger chart, placed further away from the lens. Tokina 11-16 at its maximum focal length is therefore a better performer at long ranges than when it’s very close to the object. Since most photos shot with a lens like this are taken from far away, the actual effects acquired at 16 mm should be even better than what one can infer from the chart. Let’s check the border performance. The maximum aperture leaves a great deal to be desired. Nevertheless, it must be noticed that no lens of this grade produced good results at the border of the frame and its maximum aperture. 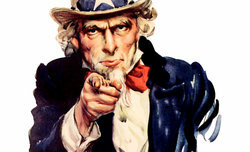 It is therefore unjustified to expect it from Tokina, whose task is much harder because of its superior speed. I have to admit I was more than sure that the borders would look as they do. If they had been better, Tokina 11-16 mm would look like and cost as much as Nikkor 14-24 mm. It’s worth adding that its border performance should be rated very high. Stopping down to F/4 causes the values to reach, or even go beyond the level 30 lpmm, so it enables us to get really crisp images. 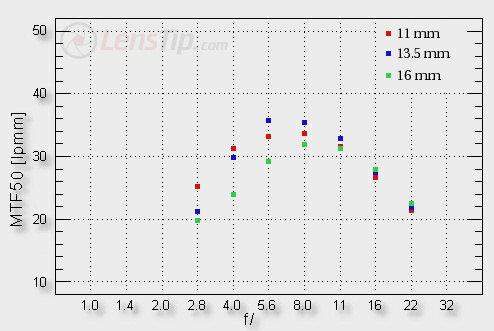 Additionally, from F/4 up, the values achieved by Tokina are higher than its competitors’, who apparently give us nothing more as their maximum aperture is about F/4. To sum up, when it comes to resolution, both in the centre of the frame and at the borders, Tokina scores best of all ultra-wide zooms designed for small matrices.